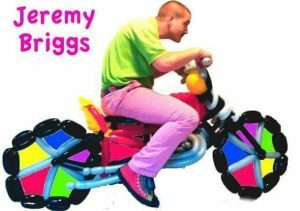 A seasoned veteran of the event & party entertainment industry, Jeremy The Denver Balloon Guy, has been twisting balloons into unique sculptures and custom latex artworks for over a quarter century. From his perch in the Mile High City, Jeremy is like a balloon superhero, intent on bringing joy to the world, one balloon twist at a time. Where he goes smiles follow, and when he leaves, satisfaction ensues… leaving happy children of all ages wanting more balloons, balloon art and of course bad, “dad,” jokes. The Denver Balloon Guy isn’t JUST a well-dressedballoon Twister & small-time comedian, he also walks on stilts and can twist small balloon art & creations from atop his trusty stilt-steeds. He can be hired for Stilt walking too, for a nominal up-charge. Considering balloon art services for your next event or party? 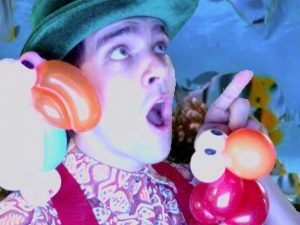 Let me, “blow,” your guests minds, by blowing some amazing balloons!